A Million Ways to be Snazzy from Flick Book Studio on Vimeo. Our second camp was the OK Go project, a.k.a. A Million Ways to Be Snazzy. This was an ambitious project—a stop-motion animation remake of OK Go’s first hit music video! (In our original announcement, we were going to use Here It Goes Again, but we soon realized it was REALLY ambitious.) We took the first 47 seconds of the video and broke it up into short (3 to 4 seconds long) segments, and grouped them into three different animation techniques: puppets, pipe cleaners, and pen and paper drawings. 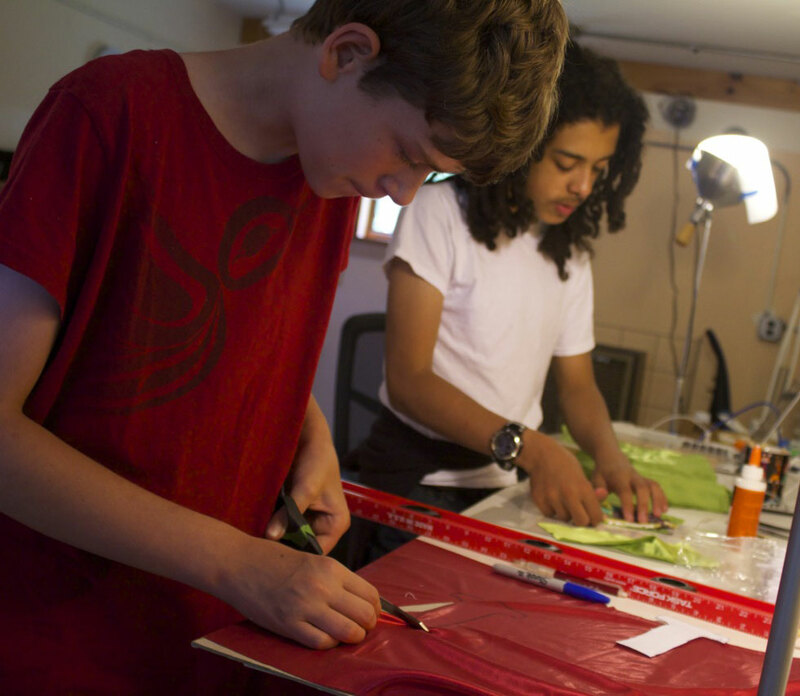 Bryce and Lion cutting out material for puppets’ costumes. We began by making the puppets, made of wire armatures, clay heads, and fabric clothes. 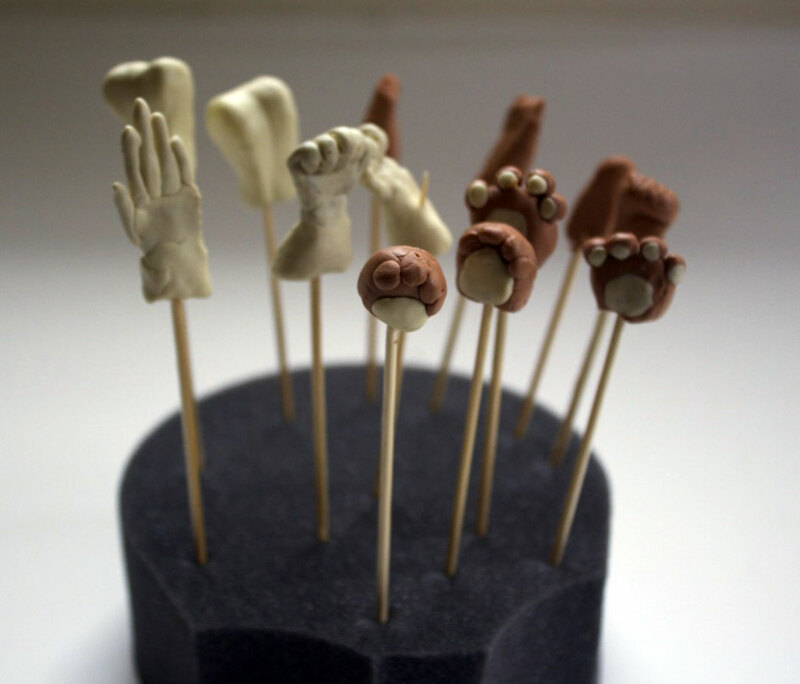 The puppets had magnets in their feet which held them upright with another pair of magnets underside of a base plate. The students gave each puppet a name—Mr. Snazzy, Snuffleufagus, J-Dubs, and Johnson (from left to right in the photo above). 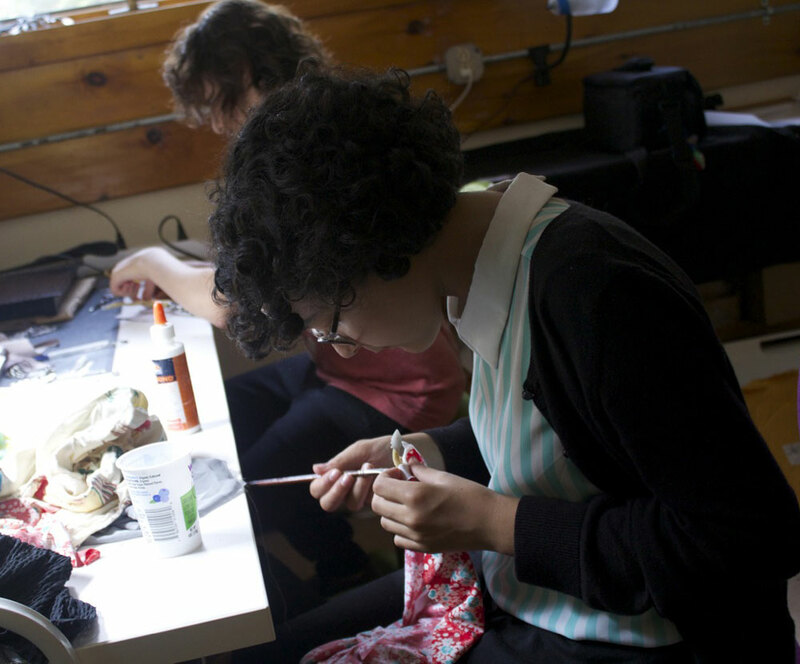 Pilar and Zephyr gluing fabric to puppets. We also used pipe cleaners, one of our favorite materials, and used a downshooting set up, with a camera secured on a copy stand pointing down. This freed the animators from the fight against gravity, but every character had to be on the same plane. We shot them against a green background so that we could layer the footage in different sizes in order to create depth. Zephyr and Bryce worked as a great team to create both segments of pipe cleaners. 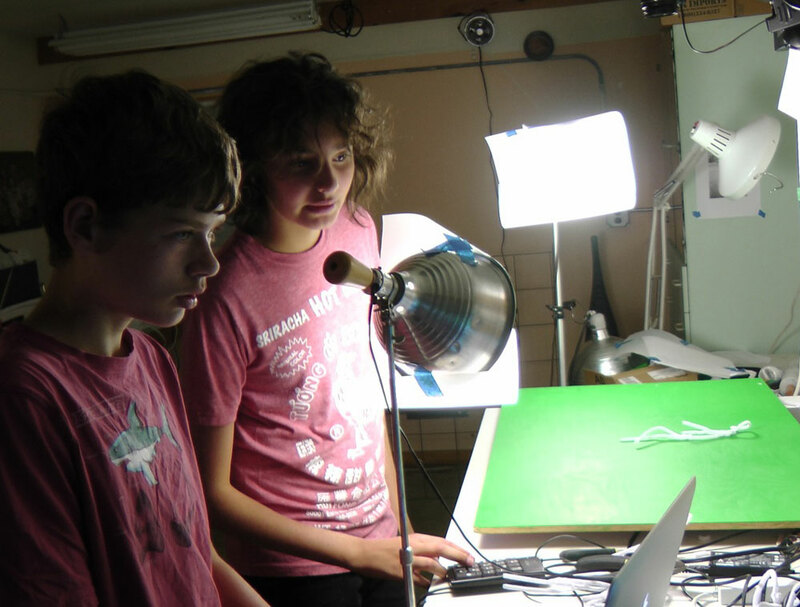 Bryce and Zephyr animating with pipe cleaners. 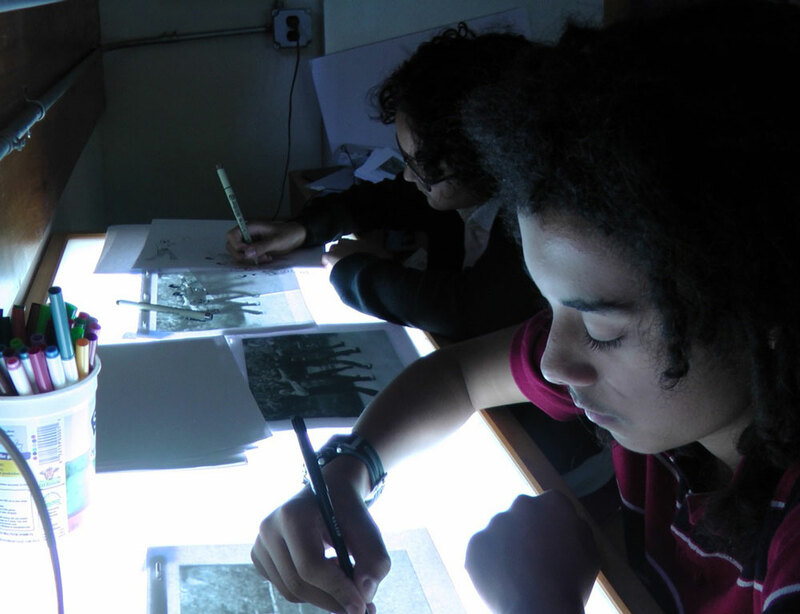 Drawing animation was tedious for Pilar, a great artist who made the first drawing section, because she took so much care in her drawing and added many details. But the result was worth the effort! The second section was done by Lion, who, once he got the hang of it, breezed through the process since he simplified the drawings into outlines. Lion and Pilar drawing on animation paper, fixed with animation pegs. The four students took turns in their roles (director, two animators, tech control) in animating the puppets. It started out with ease, but as the moves got complicated, we found our puppets were a little too tall to animate freely. The magnets, too, were not the easiest to handle, and by the time we got to the third section of the puppets, they got so frustrated they had to take a break. 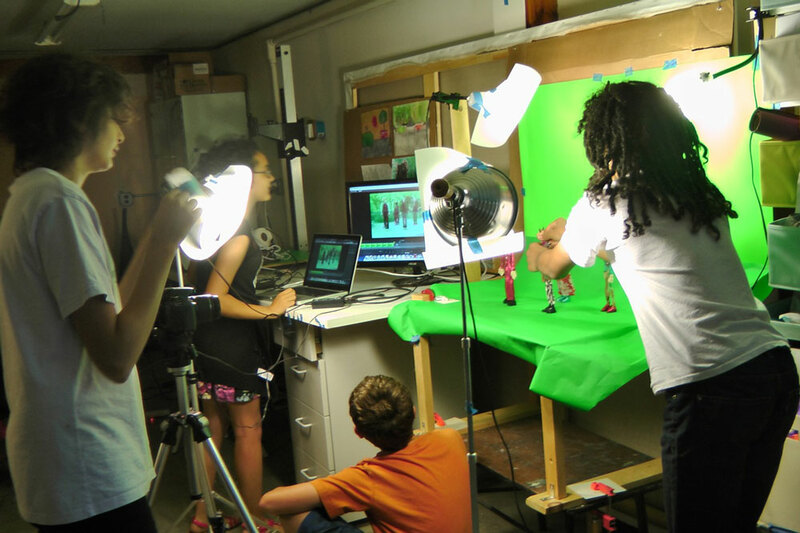 The team of four animating puppets in front of a green screen. We then realized that this was a bit too ambitious a goal for four 6-hour-sessions. 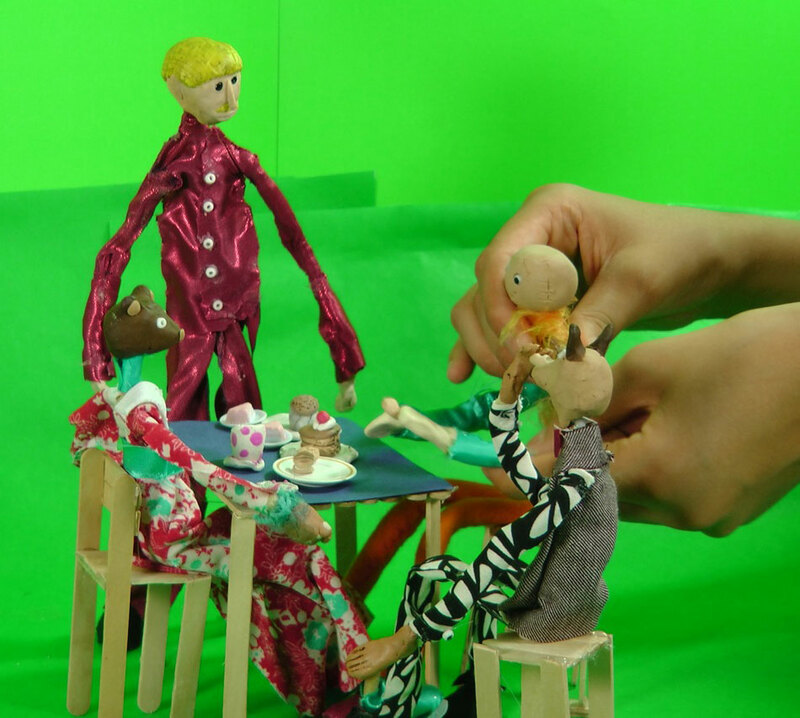 Instead of being too frustrated trying to make it work, they decided to make a behind-the-stage scene, where the puppets were taking a tea break. They are so resilient! In the end, we did not make all the animation to complete the 47 second segment, but we loved the project so much, we decided to continue with this project. This is now a work in progress—instead of compositing the puppets into the background, I decided to leave the green screen as is, with gloved hands and all, for this stage. As our project progresses and add more footage to the video, our animation will improve, with new puppets, more techniques, and materials. The final music video will reveal the students’ progress as it advances, creating something of a mini-documentary. Stay tuned!